Please also consult the best travel agencies. In order to keep the freedom to reroute the boats to meet your needs, we cannot sell via any automatic booking website1, and will not sell through any third party website claiming to own or operate the Bassac2. For our day-time cruises, please find the rates directly on each service's page. These rates are subject to change depending on the cost of fuel. The following is displayed in US Dollars. Indicative rates based on 1USD = đ23 155. All the following rates are net of all taxes and per night on board. We can arrange road and speedboat transfers through third parties at the prices current at the time of booking. As a rule of thumb, we take care of you from boarding to disembarkation. You may also ask us to provide you with other services, like land transfer or speedboat connection to or from Cambodia. These terms are available to all our clients. The present are the General Sales Terms of TransMékong. Cty TNHH Xuyên Mékong (TransMékong), Business License No. 1800503195 in Cần Thơ, Socialist Republic of Việt Nam, provides destination services under the name 9Dragons, and cruise services on board the Bassac, which it directly owns and operates, and other affiliates. The Client is the person or entity purchasing the Services from TransMékong. A Guest or Passenger or Participant is any person being provided the Services of TransMékong on account of the Client. No Party to the present Contract may misrepresent its relations to the other Parties, explicitly or implicitly, including by its subcontractors or its agents, lest the Contract be deemed cancelled on the part of that Party. In the absence of another agreement signed between the Client and TransMékong, the agreement between TransMékong and the Client (the Contract or the Booking) is entirely governed by the present General Sales Terms and the Booking Confirmation issued by TransMékong (9Dragons or the Bassac). The Contract Price is the total value of the Contract, including all local taxes and fees and non commissionable. The Contract is in effect from the Time of Booking Confirmation, that is the time TransMékong confirmed the booking in writing, and until settlement of all accounts pertaining to the Booking. Any words capitalized are defined herein. Day means calendar day, not working day. The Services for a given Booking are listed in the services schedule in the Booking Confirmation as issued by TransMékong for that Booking, at the exclusion of any other. They may include services rendered by TransMékong and some affiliates, and limited extensions thereto. Guests of join-in services are provided the Services together with other guests, and share with them any guides, means of transportation and such during the course of the Services. Guests of private services are provided the exclusive attention of any guides and use of any means pertaining to the Services. They may however come across other guests during the course of the Services. The services identified by name are defined on the page bearing that same name at http://9dragons.mekong-delta.com and linked to on the Services Confirmation mail. The programs may however vary depending on the tide and the current. More generic terms, such as family policy, optional guides and overnight accommodation, are subject to 9Dragons' services policy at http://9dragons.mekong-delta.com/en/terms/services_policy, as may be amended from time to time. The services of the Bassac include for each night on board transportation on board, accommodation of each passenger in a twin-share cabin, double- or twin-bedded, three meals, Vietnamese coffee, tea, mineral water, two visits on shore or on a small skiff, access to and from the board on a longboat. The following are not included in the services of the Bassac: road or speedboat transfer, except if specifically mentioned in the services schedule, personal travel insurance. 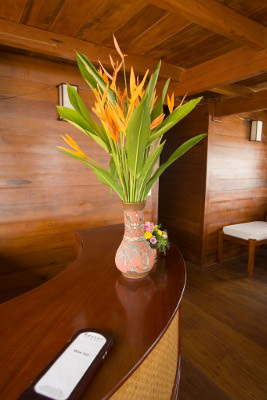 Bar services and souvenirs are available for purchase on board. TransMékong's offer takes the form of an availability statement for the services, including the terms extended to the Client and the availabilities at the time of the statement. Upon request, TransMékong may hold some availabilities on board the Bassac as a courtesy for a prospective client for a maximum of 7 calendar days, pending confirmation. the Client's account with TransMékong presents no outstanding debt. the list of the names and details of the Guests or Passengers (Rooming List). When the conditions for booking are met, TransMékong endeavours to confirm the Booking within the shortest time. These terms apply once TransMékong has confirmed the Booking in writing. Where TransMékong does not commit in advance (e.g. specific cabin or bedding arrangements, for single occupancy), TransMékong shall however make note of the Client's preferences and keep the possibility to optimize near the departure date. Should the Services include overnight services, the payment terms of these services apply, as set forth in the confirmation. The Client remits a deposit amounting to 25% of the Contract Price to secure the Booking. The Client pays the balance before the date of No-Show as defined in the cancellation policy herein. The Guests or, upon prior agreement, the Client, pay any supplements arisen during the Services at or before the completion of the Services. The Client commits to abide by the payment terms above, lest the Contract be deemed cancelled on the part of the Client, and the cancellation policy applies. In case of payment being overdue by 45 calendar days or more, the amount to be paid will increase at the interest rate of lending of the State Bank of Vietnam, counted from the date payment was due. If the Services include the services of the Bassac, the Client pays the balance before the date of Cut-Off as defined in the cancellation policy herein, all other payment terms remain the same as with 9Dragons. Cancellation or amendment of the Booking is effective as soon as TransMékong has confirmed it in writing. Should the Services include overnight services, the cancellation terms of these services apply to the respective services. Should cancellation on the part of the Client occur on or before the Cut-Off date, TransMékong shall refund the Client with all payments made on account of the Contract. Otherwise should cancellation on the part of the Client occur on or before the date of No-Show, TransMékong shall charge 25% of the Contract Price and refund the Client with any further payments already made on account of the Contract. Should cancellation on the part of the Client occur after the Date of No-Show, TransMékong shall charge 100% of the Contract Price. Payment pertaining to a cancelled booking is to be effected at the same time as if the booking were not cancelled, unless waived by TransMékong in accordance with the paragraphs above. Should TransMékong owe the Client a refund under the terms here-above, the Client may propose to employ the balance for other services of TransMékong, or TransMékong shall refund the Client by the scheduled date of the Services, in which case the refund transfer costs remain to be borne by the Client. In case of partial cancellation, the cancellation rules apply for the differences between the Contract Price before and after partial cancellation. In case of amendment of the date of the Services after the Cut-Off date, the cancellation policy does apply as if the booking had been cancelled. the Cut-Off date is 7 calendar days before the scheduled start of services. the date of No-Show is 2 calendar days before the scheduled start of services. On a join-in trip, where the Passengers join in on a scheduled trip and accept to share the board with other passengers, the Cut-Off date is 21 calendar days before the scheduled departure. On a private trip or on a chartered trip, where the Passengers appropriate the board for the duration of the Services at the exclusion of any other, the Cut-Off date is 45 calendar days before the scheduled date of departure. Regardless of the Booking being for joining in or a private or chartered trip, the date of No-Show is 5 calendar days before the scheduled departure. TransMékong endeavours to give its Clients the best possible service and retain their custom, therefore shall by all means provide the Services as per the booking confirmation. Throughout the Services of TransMékong, Guests' safety has precedence over any other considerations. In case for any reason safety could be in jeopardy, TransMékong shall retain the right to alter or cancel any or all parts of the Services in the interest of all parties to the Contract. In case TransMékong should cancel part of the Services, TransMékong shall propose to the Client an alternative service of equivalent value. Are Force Majeure any weather condition that would affect the safety of the Services, popular movement, natural catastrophe, requisition of assets, injunction by competent authorities or the effects of any such event on the availability of the Services at the time and place scheduled in the booking confirmation. In case of Force Majeure, TransMékong or the Client shall not be held liable in any way for any changes or cancellation of any Services. The Client ascertains that the health or otherwise particular conditions of its Guests are fit for the Services and do not pose a threat to the safety or security of the Services, to themselves as well as to others. The Client agrees to provide further information as requested by TransMékong where necessary to facilitate the administration of the Booking. All bookings for overnight services are nominative. The Client commits to inform the Guests in advance that they must be in possession of their identification and travel documents prior to starting the Services. The Booking's payment terms and cancellation policy may be affected where overnight services are concerned. TransMékong does not offer an insurance other than its own public liability cover. The Client advises the Guests to take a personal insurance to cover the Services. While the recipients of the services of the Bassac, the Passengers are covered by the Bassac's third party liability ("P&I") cover, typically under the rules of the Shipowners' Club. For any services booked for joining in, it is the Client's responsibility that the Passengers be present on time. If the Passengers are not there for boarding and the team is not informed of their whereabouts, this is a No-Show. For Services involving a day cruise, the time of appointment is the time of departure, and the boat may wait for the Passengers for up to 15 minutes after the scheduled time of departure. The time of appointment is 30 minutes before departure to allow for transfer to the board. If the crew has been informed in advance of the estimated time of arrival (ETA) of the Passengers at the boarding point, the boat may wait for the Passengers for up to 30 minutes after the scheduled departure time, but no later than 10 minutes after the ETA, or reschedule a rendez-vous along the way. Only paying Guests are entitled to the services of 9Dragons or accommodation on board a Bassac. 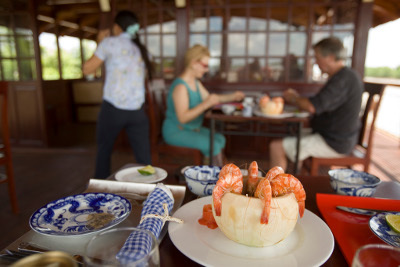 However, if TransMékong cannot provide as scheduled a guide speaking a language the Guests can speak, TransMékong will endeavour within practical limits to allow a Vietnamese tourist guide speaking the language of the Guests to accompany them. Should changes in taxes or other issue legally binding to TransMékong arise from the time of Booking confirmation to the date of the Services affect the costs directly borne by TransMékong by 10% or more, the Contract Price shall be reviewed. The General Sales Terms and Conditions may evolve with time. 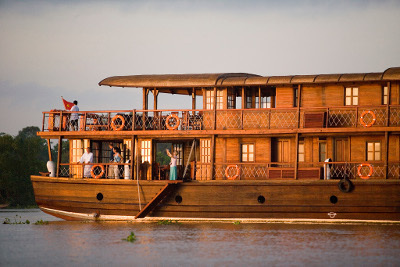 The applicable General Sales Terms and Conditions are those in force at the time of the Booking, as available here and posted at 9dragons.mekong-delta.com. TransMékong's liability shall in any case of cancellation or breach in the Contract be limited to the price already paid by the Client for that Booking. Any claims arising from the execution of this Contract shall be resolved amicably between the parties to the Contract. Only in case no agreement could be reached should the matter be brought for arbitration to the Vietnam International Arbitration Center at the Vietnam Chamber of Commerce and Industry, the decisions thereof being legal and binding to the Parties to the Contract. These terms are only available to professional tour operators. This document complements and amends for the booking of Series the agreement with the Client, as stipulated at the least in the General Sales Terms. Any terms not specifically mentioned here shall be understood as remaining as in the agreement. A Series is a booking for unnamed passengers, where the number of passengers is subject to changes after the booking. All the rules here-under apply to all Series. In case several trips were booked under these terms, each trip shall be called a Series Departure. Booking for any Series is subject to approval case by case at TransMékong's discretion. Availabilities for Series may not match the availabilities published for regular named bookings, as TransMékong reserves the right to allocate a specific boat to Series on any given day. Price: The value of the trip is calculated on the basis of the rates applicable to the Client at the departure time and for the total amount of booked passengers, assumed adult. Booking: A Series is firmly booked upon receipt of a Deposit as per the General Sales Terms. For multiple-Departure Series, the Deposit amounts to only 10% of the value of the whole Series. Upon request from the Client, and subject to availability, TransMékong shall keep the availability for the Series enough time for the Client to remit the Deposit, within a maximum of 15 days. The Cut-Off Date is the date until which the Client may cancel a Series Departure without incurring any expenses. The Cut-Off Date is 45 calendar days (Days) before the Series Departure date. The cancellation is effective upon a written and dated confirmation by TransMékong of this cancellation. An e-mail with a read-receipt being accepted as proof. Upon cancellation of any Series Departure before the Cut-Off Date, TransMékong shall put back at the disposal of the Client the entire Deposit relative to this Series Departure. Upon cancellation of any Series Departure after the Cut-Off Date, TransMékong shall keep the Deposit relative to that Series Departure. The Finalisation Date is the date before which the Client must have declared the exact number and age of the passengers of the Series Departure. The Finalisation Date is 30 Days before the Series Departure date. Failing to declare the final number of passengers at the Finalisation Date, the final number of passengers shall be assumed equal to the total number of passengers as booked for the Series Departure. The final declaration of the number of passengers is effective upon a written and dated confirmation by TransMékong of this cancellation. An e-mail with a read-receipt being accepted as proof. Upon declaration of the reduction of the number of passengers of a Series Departure before the Finalisation Date (but without cancellation of the trip), TransMékong shall put back to the disposal of the Client the part of the Deposit pertaining to the difference between the total number of passengers booked and the final number of passengers of the Series Departure. Upon declaration of the reduction of the number of passengers of a Series after the Finalisation date, TransMékong shall retain 100% of the part of the Deposit pertaining to the difference between the final number of passengers at the Finalisation Date and the remaining number of passengers of the Series Departure. In case of a request to increase the number of passengers of a Series Departure, it is effected under the same terms as a new Series booking. The Date of No Show is the date from which on any reduction of the number of passengers of the Series Departure is considered as No-Show. The Date of No-Show is 5 Days before the date of departure of the Series. From the Date of No-Show on, the total value of the Departure Date is due, even should the number of passengers effectively boarding reduce, or the Series Departure be cancelled. The Client commits to pay the remainder of the value of this trip upon invoicing. If all the names and ages of the scheduled passengers have not been stated before the Date of No-Show, the price of the Series Departure shall be calculated assuming all passengers are adults. TransMékong shall invoice the Client for settlement of each Series Departure as per the current terms applicable to the Client, relative to the date of Series Departure. Upon any payment from the Client, TransMékong must receive the total amount due by the Client. The bank charges applied by TransMékong's bank remain on TransMékong's account. Or reimbursed, in which case the bank charges are entirely on the Client's account. The final price of the Series Departure is counted according to the number of passengers having actually taken the trip (with discounts if applicable) plus the number of no-show passengers if applicable. As a quick hint: (non-contractual table). Upon booking Deposit Payment the Deposit as a fraction of the trip value. The Deposit shall be released if the Series is cancelled before the Cut-Off Date. At -45 days Cut-off The deposit remains due upon cancellation after this date. At -30 days Final Pax# The Deposit is due to TransMékong for the number of passengers assumed going from this date on. At -5 days No Show The price of the trip is due to TransMékong. Grant you free access to all information you entrusted us with, by a simple e-mailed request. Write to us to receive a copy of your file at your registered e-mail address. You will have an opportunity to rectify any erroneous information. Refrain from using the information you entrusted us with with a view to anything else than proper management of our relationship. Our banking coordinates and the rules to apply for payment. Our bank must receive the total amount of your remittance. Thus upon transfering, you should stipulate that the transfer fees of your bank are charged to you. The receipt fees of our bank remain at our charge. Ship rental is just like for a simple private trip on the scheduled route. Accommodation and services to the passengers are just like for a private trip on the scheduled route. Empty ship transfer: If you decide to depart from another port than the regularly scheduled one, or arrive at another port than the departure port of the regularly scheduled trip on the day of your arrival, we would ask you to take charge of the expenses incurred.